These koftas or meatballs can be made with chicken or turkey mince. The koftes are poached instead of fried making this a lighter more healthful recipe. PUREE ONIONS, TOMATO, CHILLIES, GARLIC GINGER PASTE, TURMERIC AND CAYENNE IN A FOOD PROCESSOR. HEAT OIL ON A MEDIUM FLAME, WHEN HOT ADD ALL THE SPICES FOR THE TEMPER AND COOK ABOUT 1-1.5 MINUTES UNTIL FRAGRANT. ADD ONION AND TOMATO MIX AND COOK UNTIL REDUCED TO HALF ITS VOLUME. STIR FROM TIME TO TIME TO PREVENT BURNING. ADD 600ML COCONUT MILK AND COOK ANOTHER 12 MINUTES, STIRRING FROM TIME TO TIME. PROCESS THE DRAINED KHEEMA IN A FOOD PROCESSOR. PULSE 1-3 TIMES IN SHORT BURSTS. DO NOT GRIND THE MEAT TO A PASTE. JUST A FINER CRUMB UNTIL THE MEAT CLINGS TOGETHER. 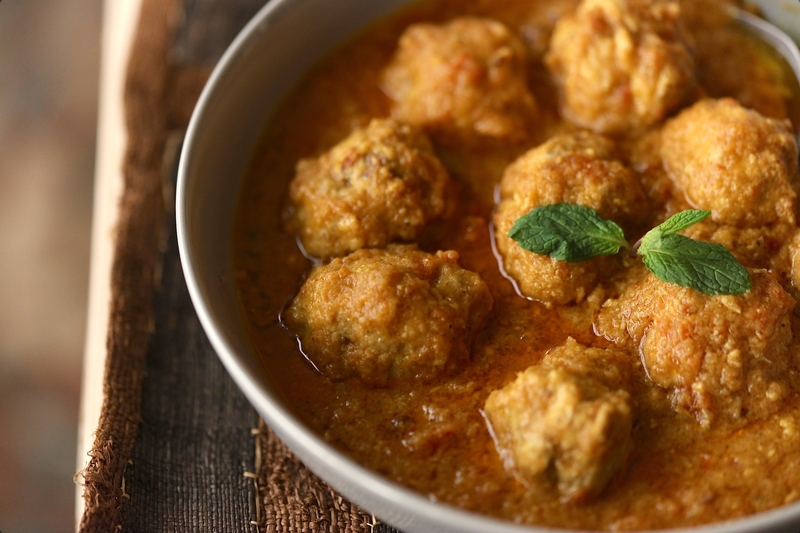 COMBINE ALL THE INGREDIENTS FOR THE KOFTA IN A LARGE MIXING BOWL UNTIL THOROUGHLY MIXED. DIVIDE INTO 24 BALLS. REDUCE FLAME UNDER GRAVY TO LOW. GENTLY LOWER KOFTAS INTO HOT COCONUT AND ONION GRAVY. USING A SMALL SPOON POUR SOME OF THE GRAVY OVER EACH KOFTA TO ENSURE THEY COOK THROUGH. COOK OPEN ABOUT 12 MINUTES ON LOW FLAME UNTIL MEATBALLS ARE COOKED THROUGH. AVOID STIRRING. SWITCH OFF FLAME. ALLOW IT TO COOL ABOUT 15 MINUTES. 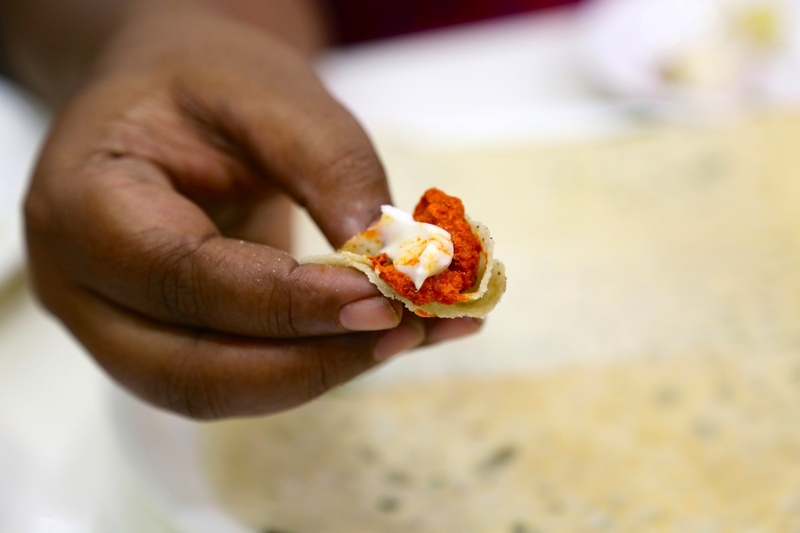 SERVE WARM WITH ROTIS, NAANS, PITA OR TANDOORI ROTI. 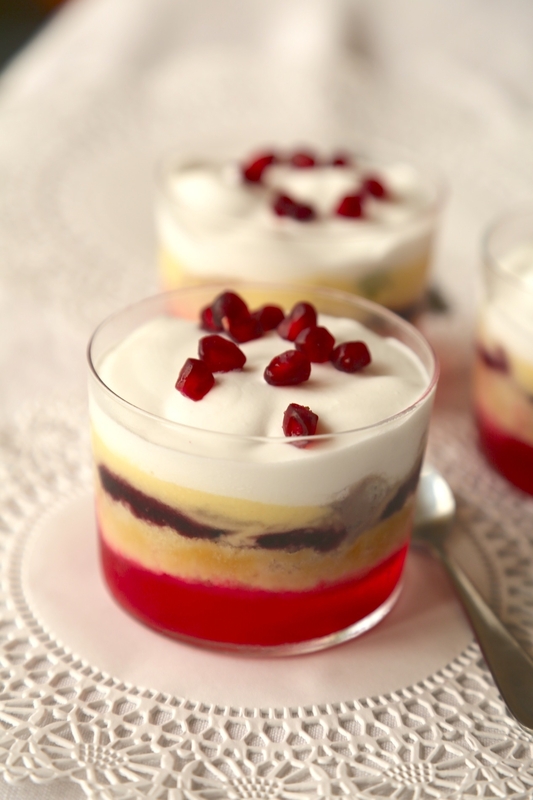 These are elegant desserts to make when pomegranates are in season. Pineapple and pomegranate is a lovely combination. In some countries you can get fresh pomegranate juice to order, which will save you the effort of making it. Be sure the juice is strained and you will need heat proof glasses or jars. Add pomegranate juice, sugar and 300 ml water and bring to a gentle simmer over medium heat. Keep cooking and stirring until it reaches a boil. Meanwhile, soak the gelatine in 1/4 cup of room temperature water to soften it about 5-7 minutes or follow instructions for Agar Agar. Add gelatin to the hot fruit syrup and stir to dissolve completely. Divide hot liquid into 8 individual glasses. Let rest 20 minutes. Chill in the fridge until loosely set about 5 hours. Make the custard according to pack instructions with the custard powder, milk and 50g sugar to create a thick custard. If you prefer a custard with eggs you can also make a custard from scratch. Cover tightly with wrap, pressing the wrap down on the surface of the custard to prevent a skin from forming. Chill. When the custard is chilled and the jelly has set spoon or pipe custard into the 8 jars, smoothening the tops to make them even. Scatter a few pomegranate seeds and the sliced bananas over the custard. While the jelly and custard sets pour the pineapple juice and or liqueur over the crumbled cake. Allow it to soak 10 minutes. Spread the cake crumbs over the top of the chilled custard and press down lightly to create an even surface. Whip the cream with the vanilla and icing sugar until soft peaks form- don't over beat or the cream will split. Spoon or pipe around the top of the fruit. Scatter with the pomegranates before you serve them. Keep covered and refrigerated until you are ready to serve them. 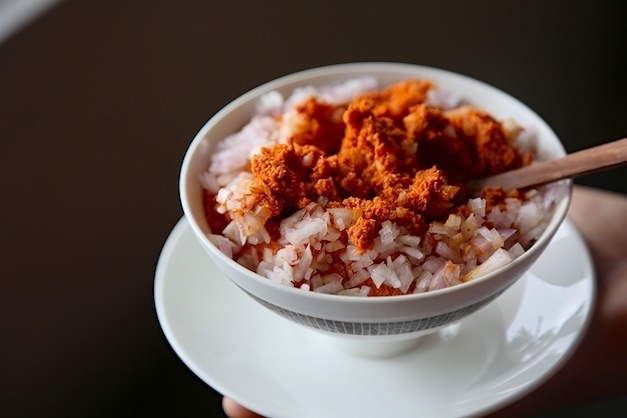 This curry is a staple of the Indian Sindhi community. It's a sophisticated dish with a medley of vegetables and a tangy, robust curry made with chick pea flour. Like a Gumbo the roux is made by cooking flour in fat. However this dish is vegan and gluten free and the roux consists of chick pea flour and vegetable oil cooked to a burnished bronze. Some cooks prefer a thinner, lighter gravy but for me the beauty of this dish is a gravy rich in color, full in flavor and depth that imitates a non vegetarian gravy. For a lighter gravy cook the gram flour to a lighter color and add more water for a thinner version. HEAT VEGETABLE OIL IN A LARGE OVER SIZED POT LIKE A 6 QUART DUTCH OVEN OR 5-6 LITER KADAI/WOK ON MEDIUM FLAME. STIR IN THE CHICK PEA FLOUR USING A WHISK TO MAKE A SMOOTH PASTE. KEEP STIRRING UNTIL COLOR CHANGES TO A GOLDEN BROWN. THE ROUX WILL BE VERY HOT, AND BUBBLY. KEEP STIRRING TO PREVENT BURNING. THIS COULD TAKE 8-10 MINUTES. ONCE THE MIXTURE IS FRAGRANT AND A COPPER COLOR ADD THE MUSTARD SEEDS, CUMIN AND FENUGREEK SEEDS. THEY WILL SPLUTTER VIGOROUSLY SO STAND BACK. USE A SPLATTER SCREEN IF YOU WISH. LOWER FLAME AND ADD ASAFETIDA AND CURRY LEAVES. STIR RAPIDLY. OPTIONALLY, IF YOU ARE NOT COMFORTABLE TEMPERING SPICES DIRECTLY IN THE ROUX YOU COULD HEAT 2 TABLESPOONS OF OIL IN A SMALL SKILLET, TEMPER THE SPICES IN THIS HOT OIL SEPARATELY AND ADD IT TO THE VEGETABLES LATER. COOK SPICES ABOUT 1 MINUTE. ADD 1 LITER OF WATER AND STIR WELL. ADD POTATOES, CHILLI POWDER, SUGAR OR JAGGERY AND TAMARIND PASTE. STIR WELL AND COOK ON HIGH HEAT ABOUT 15 MINUTES. STIR IN CARROTS AND COOK ANOTHER 15 MINUTES ON MEDIUM HEAT. WHEN CARROTS AND POTATOES ARE ALMOST DONE ADD THE GREEN BEANS AND THE OKRA AND DRUMSTICKS IF YOU WISH. COOK UNTIL ALL VEGETABLES ARE TENDER AND EDIBLE. THE GRAVY WILL THICKEN. YOU CAN ADD MORE WATER FOR A THINNER CURRY. ADD SALT TO TASTE AND MORE SUGAR AND CAYENNE PEPPER IF DESIRED. 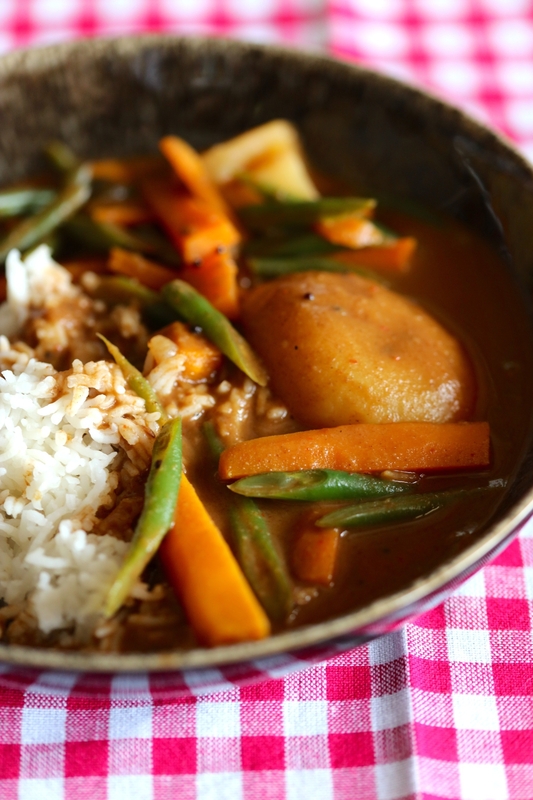 SERVE HOT WITH PLAIN, WHITE BOILED RICE. 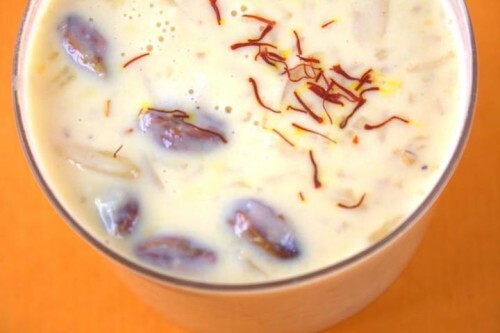 Kheer is the most famous of Indian desserts.This version contains powdered almonds and rice. Wash the rice, drain and boil in 1 cup of water over high heat in a large pot. Mash the rice with the back of your ladle as it cooks. Add the milk and continue cooking for about 25 minutes on medium heat, till the mixture begins to thicken. Stir sides and bottom of the pan frequently to prevent burning. When the milk has reduced to half its original volume, stir in the sugar and cook for 3-4 minutes until sugar dissolves. Mix in the cardamom, nutmeg and saffron with its soaking water. Remove from heat and stir in the powdered almonds. Cool. Cover tightly with plastic wrap or a lid. Chill 6-8 hours. Remove from the fridge and stir well. 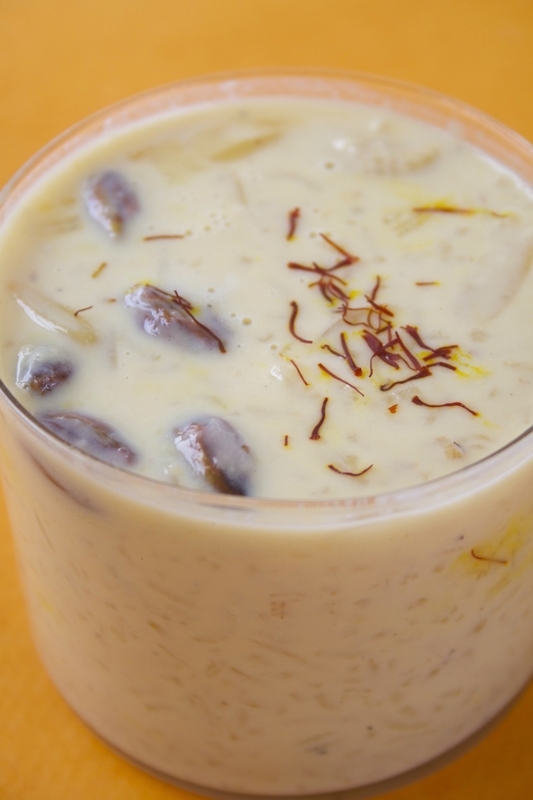 Add a little milk or water to thin the kheer if you like a thinner consistency. 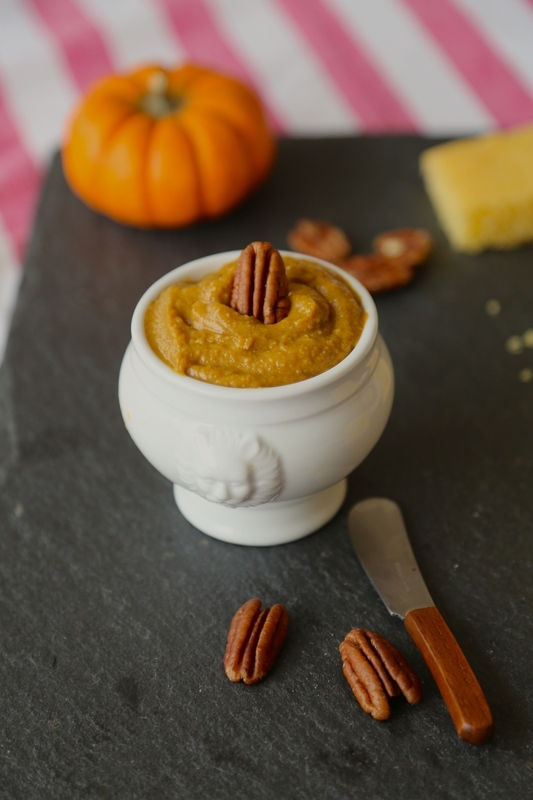 In cold weather, this pudding can be served warm. Add the powdered almonds to the hot kheer and let sit 10 minutes. Garnish and serve warm.